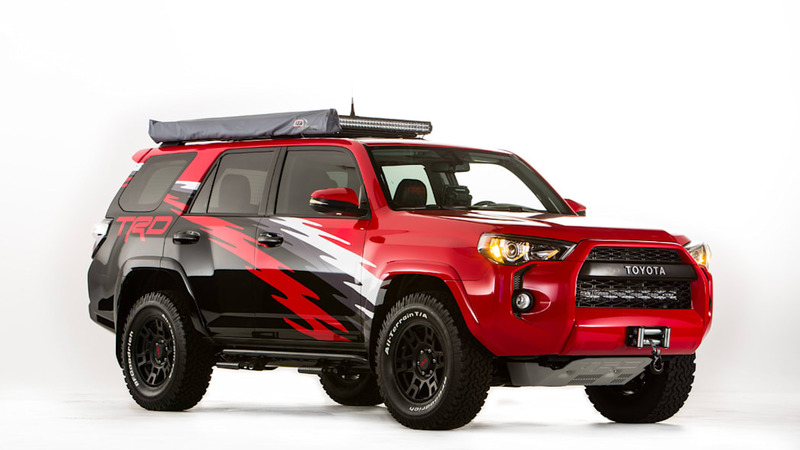 Toyota has released the first images of its brigade of concepts for the 2014 SEMA Show, introducing a trio of TRD-fettled off-roaders, a pair of DUB-inspired models, a race-ready pickup and a Sienna minivan with 48 inches worth of subwoofers. Four of the vehicles being shown by Toyota will take part in the grueling Baja 1000 off-road race. 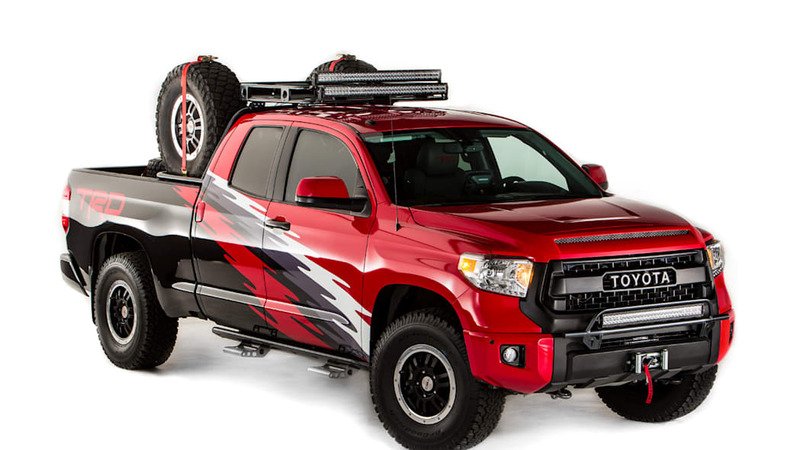 The star of that effort will be a race-prepared Tundra, which will actually be competing from November 12 to 16 in the 47th running of the desert race. It'll be supported by a trio of vehicles, which mimics Toyota's TRD Pro Series production vehicles, with the 4Runner, Tacoma and Tundra all acting as support vehicles. Each of these vehicles has been fabricated by the off-road specialists at N-Fab and comes loaded down with communications and guidance equipment, additional lights and off-road body modifications. For softer trails, Toyota will introduce modified examples of its refreshed Sienna minivan and Yaris subcompact. 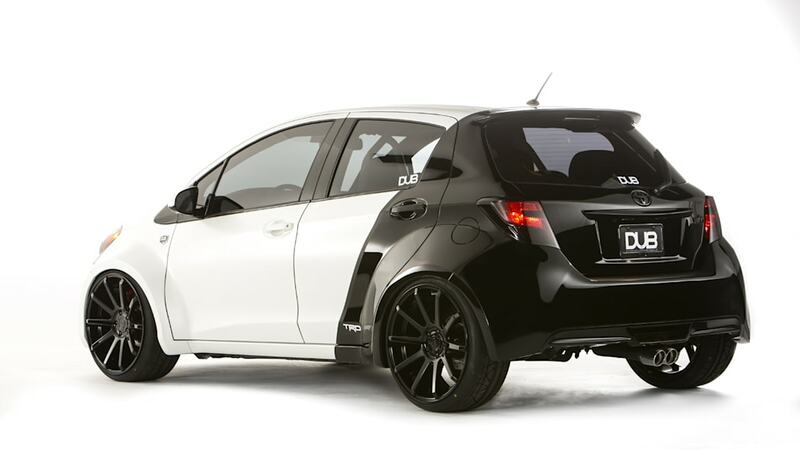 Styled by DUB, the Yaris' headlines include 20-inch Dropstars wheels on a custom, lowered suspension. A big-brake kit from TRD complete with StopTech rotors rounds out the chassis changes. Aesthetic tweaks include Sparco racing seats, carbon-fiber interior bits matte white pearl paint and a custom widebody kit. 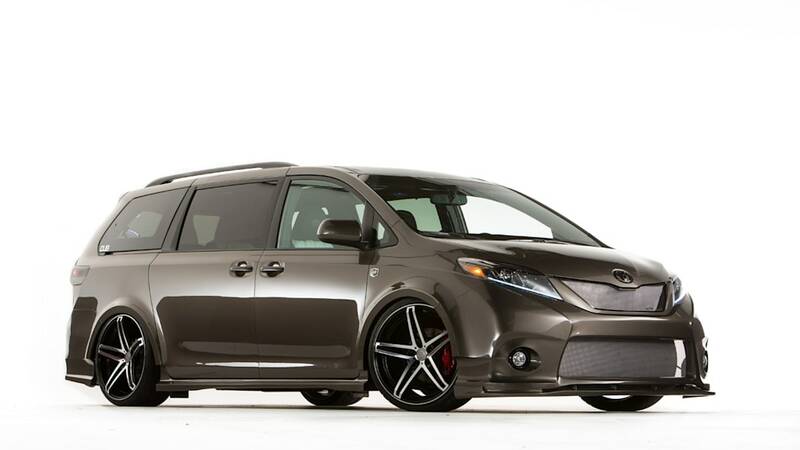 A similar treatment has been applied to the Sienna, which is home to an eye-catching quartet of 22-inch wheels. Like the Yaris, the minivan benefits from a lowered ride height and larger brakes. The seats feature custom black-and-white leather upholstery, four subwoofers, eight speakers and two amps, all from DUB. The exterior has a widebody kit, Galaxy Grey paint and tinted windows. Finally, audiophiles will flock to the West Coast Customs-built Sienna:Remix and its 48 inches of subwoofers and 156 inches of speakers. Oh, and those are just on the outside of the van. Power is fed to this wild system by five high-powered amps while a DJ can spin in the plug-and-play booth. Two 40-inch monitors provide some visual panache, spicing up the mostly production Sienna exterior. A set of Giovanna mesh wheels are the most notable exterior change. Scroll down for the press from Toyota, and then stay tuned for our full recap of these new models from the floor of the SEMA show. TORRANCE, Calif., Oct. 27, 2014 - Toyota's 2014 Specialty Equipment Market Association (SEMA) Show presence will be focused on its performance legacy - past, present and future. The Toyota display booth will feature fifteen unique vehicles that boldly underscore the company's commitment to truly push the limit of both man and machine. Whether on the racetrack, out in the desert or on the street, this year's SEMA booth puts an exclamation point on what it means to accessorize. As Toyota Racing Development (TRD) celebrates its 35th anniversary this year, the renowned engineering and motorsports division will have a prominent role in Toyota's SEMA space. TRD-engineered components add to the sporting intent of almost every vehicle on display. 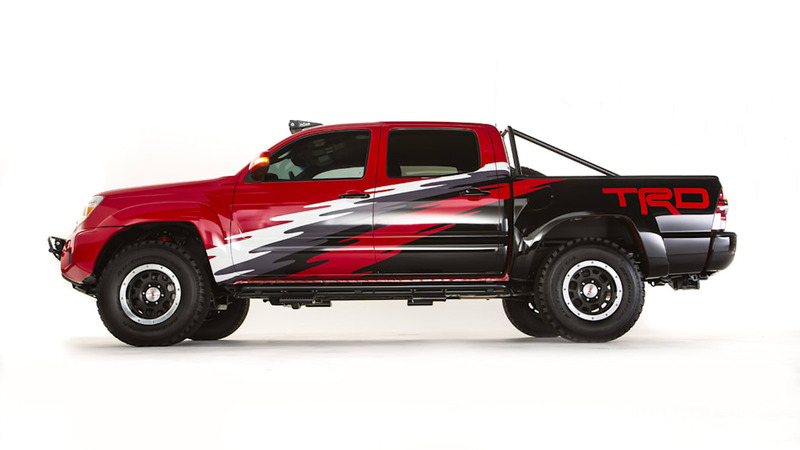 The 2015 Tundra TRD Pro Desert Race Truck as well as three bona-fide chase trucks equipped with TRD Pro upgrades - a 4Runner, Tacoma and Tundra - will be on display at SEMA before heading down to the 47th Tecate SCORE Baja 1000. The notoriously grueling race will give the vehicles and their TRD accessories a chance to prove their durability over 1,000 miles of unforgiving Baja desert. The multi-championship-winning Toyota Tundra Trophy Truck, once piloted by the legendary Ivan "Ironman" Stewart, will also be on hand. The past and present truly collide, as the Ironman will be serving as mentor to the entire Toyota off-road race team this year. Toyota has a history of racing and performance on the tarmac too, and plenty of other vehicles will be on hand to demonstrate that. 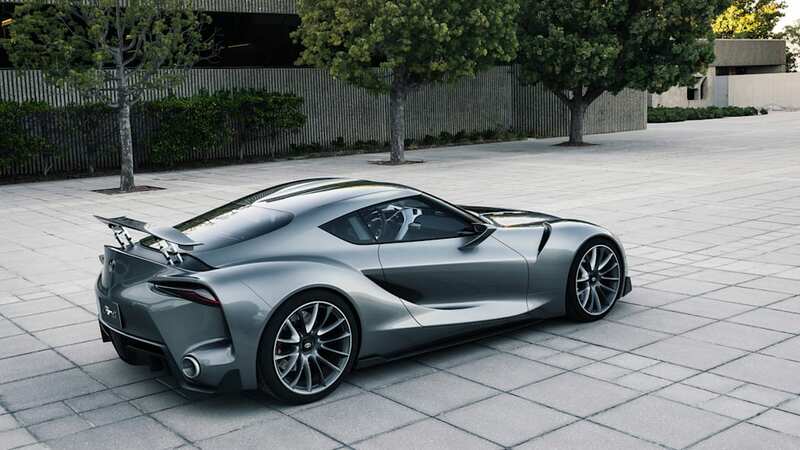 Taking center stage will be the Toyota FT-1 sports car concept, labeled the spiritual pace car for the new direction of Toyota Global Design. The bold new 2015 Camry will also be on hand in two distinct interpretations - the 2015 Toyota Camry Cup Car that will compete in the NASCAR Sprint Cup Series, as well as the DUB Edition Camry that has been massaged to take the car to a new level. The DUB Edition Yaris and DUB Edition Sienna feature a host of custom modifications that give both vehicles a radically different look. 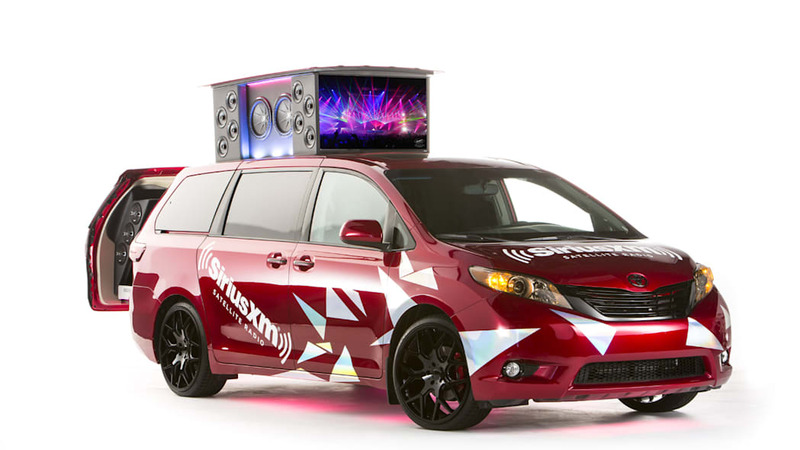 SiriusXM and West Coast Customs have joined forces to create the Sienna:Remix - the ultimate "Swagger Wagon" that transforms into a fully functional DJ booth replete with enough speakers and power to rock a party hard. "What better place than SEMA to show the automotive world what our passion for performance looks like," said Steve Appelbaum, Toyota's engagement marketing and motorsports national manager. "Toyota is making cars and trucks that inspire creativity amongst the enthusiasts who live and work in the SEMA industry, and we're so excited to show what that kind of bold imagination can produce with our vehicles." 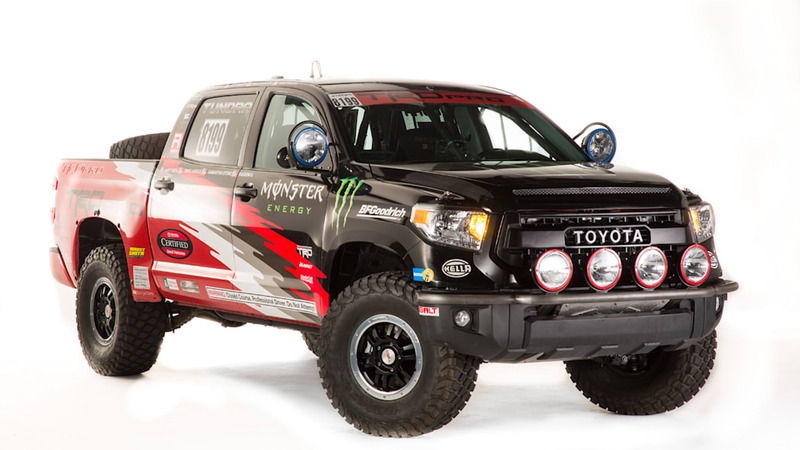 The entire collection of project vehicles can be seen in the Toyota display booth (#24700) located in the Central Hall at the 2014 SEMA Show from November 4-7.